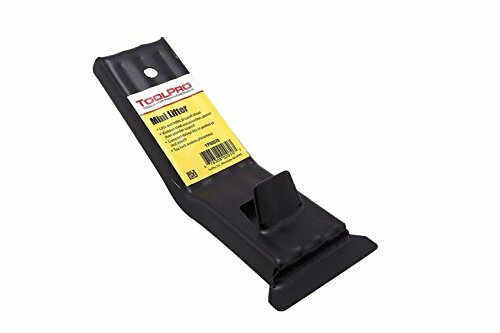 ToolPro Drywall Panel Lifter Panel lifter allows a single person to raise and hold a gypsum board against the wall while leaving the hands free to secure it. Simple lever action make raising a heavy panel effortless, no better way for a single person to install drywall. The pivot point is reinforced with a 1.9 x 5" curved steel plate welded into the one piece steel body. The toe kick allows easy maneuvering and placement with your foot. 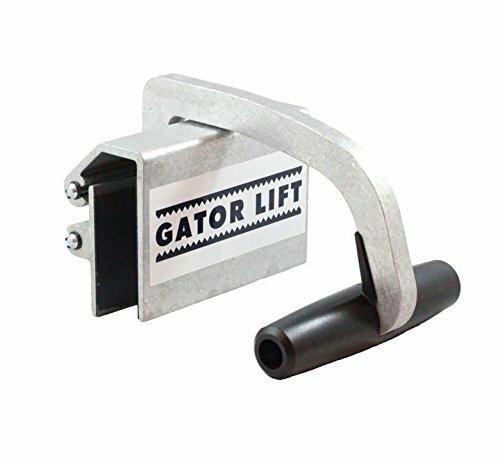 Lifter is built to last, 100% steel, plated and powder coated. Made in the USA. About the Manufacturer ToolPro produces quality tools designed specifically for the professional contractor and installer. They understand that quality is your first concern when shopping for tools that will be subjected to the heavy demands of construction professionals, so all tools are field tested to ensure they are "jobsite ready". ToolPro's focus is on innovation, quality and value, a focus that is readily apparent when you use these tools. Simply the best choice for installers and finishers in the Drywall, EIFS, Stucco and Acoustical trades. 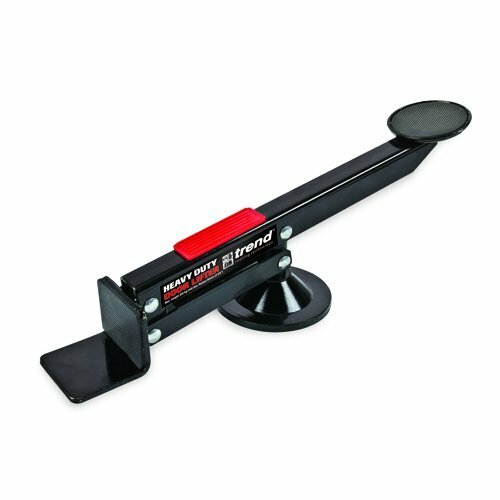 Heavy duty door lifter allows up, down and side to side movement for easy positioning and fixing of doors, panels & drywall boards. The new heavy duty design has a maximum weight capacity of 440 pounds with a maximum lift height of 2-3/8 inches. 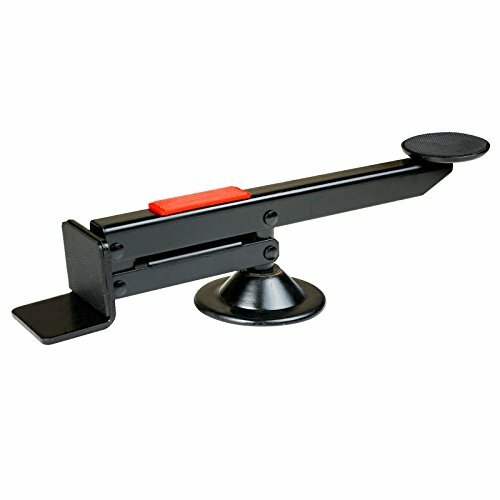 Bon's mini steel board lifter lifts all standard sizes of drywall sheets. Lightweight and compact by design allows this unit to easily fit in your pocket. About the Manufacturer ToolPro produces the highest quality tools designed specifically for the professional contractor and installer. They understand that quality is your first concern when shopping for tools that will be subjected to the heavy demands of construction professionals, so all tools are field tested to ensure they are “jobsite ready”. ToolPro’s focus is on innovation, quality and value, a focus that is readily apparent when you use these tools. Simply the best choice for installers and finishers in the Drywall, EIFS, Stucco and Acoustical trades. Description: - The safe and conveient way to carry plaster boards, wood panels, drywall plywood sheet, etc. - Take the strain off your arms and upper body and make navigating tight spots easier with a plastic panel lifter, available at home centers. 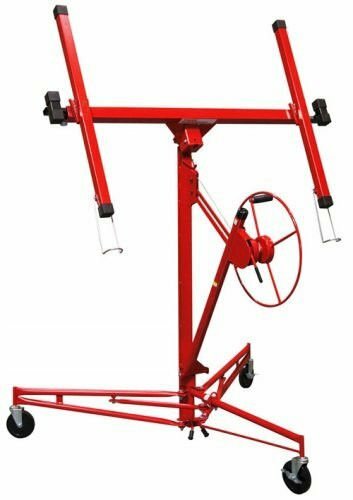 - Just hook the panel lifter around the bottom of the sheet at the center point, tip the sheet up and lift, leaving your lifting arm fully extended as if you were carrying a suitcase. - Use your other arm to balance the sheet, keeping the drywall close to horizontal. 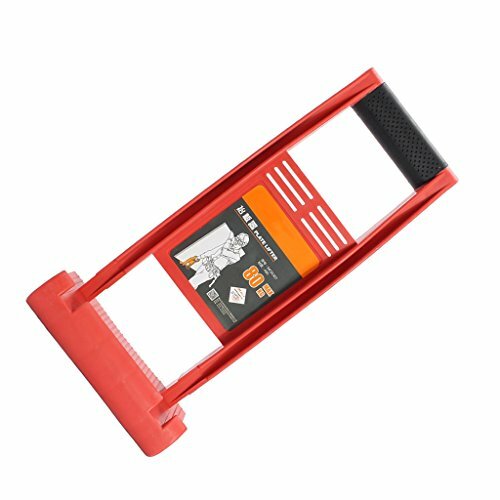 - You can move drywall with half the effort, skidproof TPR soft materials and waistline for comfortable and safe working.Specification: - Maximum Load Bearing: 80 kg - Material: ABS engineering plastics - Color: Red - Height: Approx. 370mm/ 14.57 inch - Base Length: Approx. 165mm/ 6.50 inch - Handle Length: Approx. 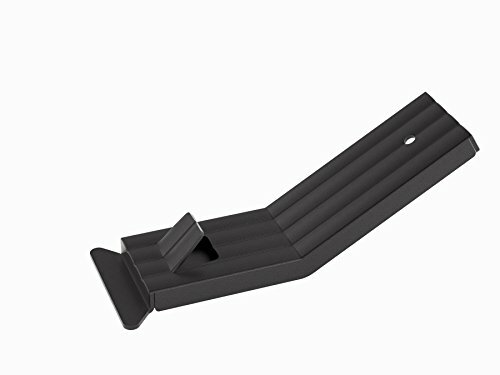 130mm/ 5.12 inchPackage Includes:1 Piece of Panel Carrier GripperWe have many years of experience in selling merchandise online, we are focus on providing best product and service to customers. 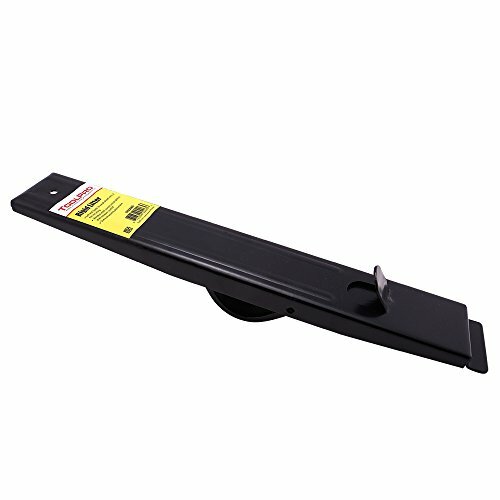 Whether you're installing a door or putting up drywall, The POWERTEC 71116 Swivel Board and Door Lifter is a "must have" addition to your home or professional workshop assembly. This handy component allows you to easily and safely move and lift large panel-shaped workstock in both horizontal and vertical planes until the most advantageous stock placement is found. When stock is optimally situated, the user is free to quickly and easily get the job done to perfection. A handy foot-activation feature offers convenient hands-free control, while protecting the worker's back and hands from harm. Simply press foot down to achieve effortless lifting action, and rotate stock (360-degrees) by moving foot from side to side - it's that easy. The POWERTEC 71116 Swivel Board and Door Lifter makes installing doors/drywall/ sheetrock a simple and satisfying one-man job. Efficient, effective and durable - You'll wonder how you ever got along without it. Looking for more Board Lifter similar ideas? Try to explore these searches: Mounted Pre Rinse Spray, Dodge Grand Caravan Seats, and Lind Power Pack. Shopwion.com is the smartest way for comparison shopping: compare prices from most trusted leading online stores for best Board Lifter, Florida State Carpet Tiles, Chevrolet 2500 Pickup, Board Lifter . 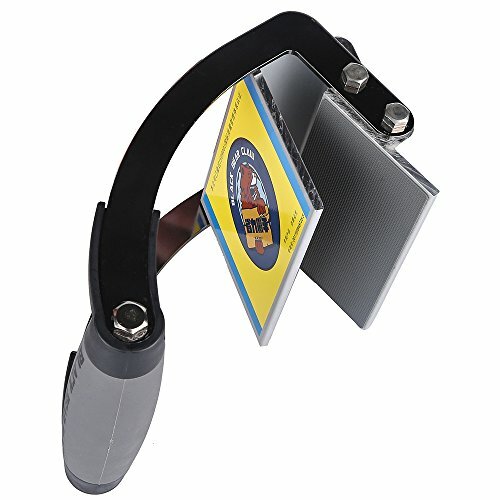 Don't miss this Board Lifter today, April 25, 2019 deals, updated daily.